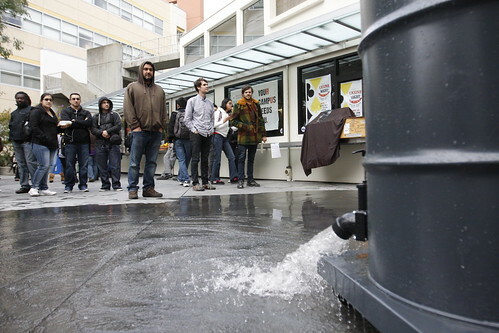 The Cesar Chavez Student Center was evacuated this afternoon due to a flood. A pipe burst on the Plaza Level of the Student Center and the building is expected to be closed for at least an hour, according to Taylor McElroy, the building manager. McElroy said there were more damages than first anticipated. The flood disrupted business and a craft fair taking place very close to where the flood started. One merchant and their merchandise got wet when the pipe burst, but the remaining 10 did not have their merchandise damaged. “I got wet, but but my merchandise did not. Thank God,” said Ismael Morales, a jewelry merchant at the craft fair. Students were startled by the incident, but there were no injuries. “I was upstairs and the sprinkler was going off and it was flooding and smelled like oil. I thought (the evacuation) was going to be 20 minutes, but we were told it would be an hour,” said Rachel Prince, 18, biology major, who works at the computer lab in the student center. Students were allowed to re-enter the building at around 3 p.m.
UPDATE 1:23 p.m.: Students are being allowed back into the building but are being restricted to the food court area. UPDATE 3:30 p.m.: Students have been allowed to return to all areas of the building, though the entrance facing Burk Hall remains blocked off. A section of flooring that is still wet remains taped off. All businesses are open and the craft fair has resumed. 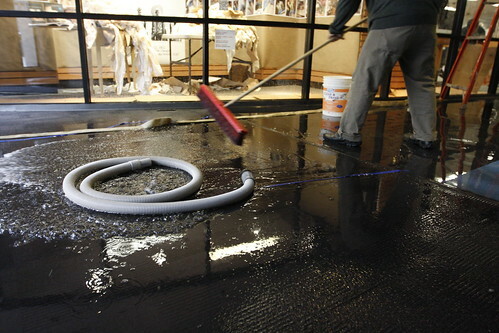 SF State employees clean up water that flooded the lobby of the Cesar Chavez building after a pipe broke around 1 p.m., Nov. 29, 2011. Photo by Erik Verduzco. A broken pipe near the entrance of the bookstore inside the Cesar Chavez building flooded the ground level around 1 p.m., Nov. 29, 2011. Photo by Erik Verduzco. 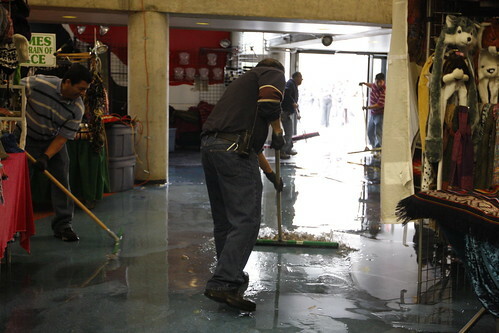 SF State employees clean up water that flooded the ground level of the Cesar Chavez building after a pipe broke around 1 p.m., Nov. 29, 2011. Photo by Erik Verduzco. Nelson Estrada contributed to this report.